My name probably comes from the tribe of Hamadiths, one of the first Arab arrived in Algeria. In defeat, facing the Berbers led by Kahina, a part of the tribe descended to the south, another settled in Kabylia, it is the family of Beni Abbes. I have the chance to have a double culture: Arabic by my mother, a native from Tiaret, the highland region of Algeria (related with the Zaouia of Issawa), Berber by my father, from small Kabylia. He was also from Sufi persuasion. I lived this double belonging as great richness and a source of freedom. From my childhood in Tiaret, I remember my escapades in the souks, and hours spent, captivated by the words of Gouels, public tellers. I would also see the fakirs. Today, these characters have disappeared from the public plaza in Algeria. The words also rocked my evenings, when I was sitting on my father’s lap. He exercised the profession of brachmi, this artisan who weaves the string of bunting and djellaba. He gave rhythm to his work by stories and songs of Kabylia. Thus I became a storyteller without knowing. In the 1970s in Algeria, my training was by my involvement in political organizations and by being on university benches. By early adolescence, I became a cloistered girl, but thanks to the help of my mother, I escaped by hiding in a library and a youth organization (the FLN, became UNJA). At that time, I received the influence of French cooperating teachers, most of them sixty-huitards. It was around my 15 years, I read Simone de Beauvoir, Sartre, the Brothers Karamazov, Anna Karenina, Solzhenitsyn, and listened to songs text (Brassens, Ferrat, Brel, Léo Ferré). It’s Oran who freed me. I then joined the PAGS, avant garde socialist party, ie the Algerian Communist Party, which has become my adopted family and with which I have long advocated. But facing some judgment that I consider a little too strict for my free woman temperament, I retired from the PAGS. I came back to the period of terrorism, as it was necessary to resist. I then had the chance to meet the leftist movement, where I met my husband. It is he who opened my mind to the pleasure of singing, dancing and travel. We had three children. My eldest, who died young in 2002, was particularly sensitive to the wonderful world of the stories I told them. How did you become a member of the Petit Lecteur ? The founding members of the Petit Lecteur were my friends from college. With them, I knew the student movement. I was bringing my kids. During the black decade, I hosted workshops at the Petit Lecteur. In 2005, Zubaida Kouti asked me to become project manager of the first storytelling festival, which lasted 10 days. It is in this context that Jorus Mabiala Congolese storyteller animated storytelling workshops with the French Institute. From there, I began to tell stories in public, first in schools or in the Petit Lecteur. There was fear. Beautiful family, major landowners. The festival has become the Lighthouse activity of the Petit Lecteur, and it is the only Algerian festival dedicated exclusively to tale. There are Racont-art in Kabylia, that of Constantine, but its include other art of speech. We hope to find people who can manage it after us. What are your preferences in tales? I searched for stories related to the sea, there are many. In the fishery where I was teaching, I had met Bashir el Madrili (Bashir from Madrid), which was covered with scars and had no more than 3 fingers. He was a Docker and joined the PCA. He had fought in Spain and in the dock strike of Oran in February 1950 who refused to load ships that was leaving for Vietnam. This strike was heavily mastered. This story he had entrusted to me, I told in the presence of the Consul of France. For me, there is a link between the expression of discomfort, pain, listening, and sharing of speech. What are the guidelines of the next storytelling festival of the Petit Lecteur in March 2016? At the next festival entitled: once upon a time travel and migration, in order to make the connection between human movement and travel stories, we will present the full shows, such as “Once upon a time the languages.” We also wish to emphasize the role of the tale in the public space, open to a wider audience. There will be a ballad told in connection with Bel Horizon and a ballad told on the metro. Public authorities support the idea of ​​the Festival? Yes, the Festival is sponsored and inaugurated at City Hall. Other festival activities will be undertaken in partnership with management of culture, management of National Education and the French Institute. How do you choose storytellers ? We invite Mediterranean storytellers (Algerian, French, Spanish, Lebanese, Tunisian, Palestinian and Moroccan and sub-Saharan Africa. Especially Congolese storytellers but also Ivorian and Burkinabe For now, we cannot pay fees, we only reimburse the travel and pay for all living expenses. What is the project of the House of tale of the Petit Lecteur ? The house of tale was set up two years ago. This house is to host trainings, provide rehearsal spaces, representations and welcome any form of art of speech, including the slam. We acquired a background tales of the world. 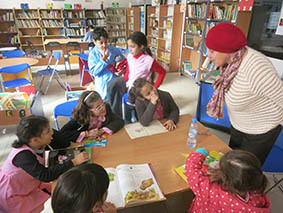 It is in this library that young storytellers come to expand their repertory and transmit it in Algerian Arabic. In the project we will implement as a resource center that aims to welcome authors, storytellers, researchers, to offer training on the book trade, the collection and sharing stories. What is interest to know the traditions of Central African tale ? For us to know the richness of black African cultures is of great importance. First, because of the many junctions between our traditions and those of Black Africa, are too little known. Secondly, because in many countries of sub-Saharan Africa, the story is still present in daily practices. Mothers sing very educational rhymes for babies they carry on their backs during the work. 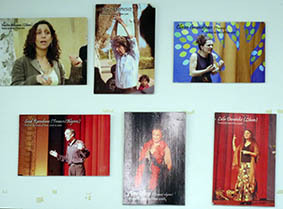 What role the House of tale is playing in the preservation of Algerian heritage ? There is a challenge in the fact of thinking the transcription of tales. It’s about finding the right distance between the absolute respect of the text as delivered and innovation. In my view, certain elements must be preserved as nuggets: proverbs, songs, idiomatic expressions, but the way to get them may change. We do not only seek to promote the story, but to promote storytelling as art. Our project is called “If Gouel were told to me.” Although this business has almost disappeared, but we want to revive the practice of speaking in public place. 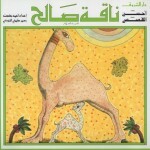 Share the post "The path of a storyteller in Algeria"